Album art for Coheed and Cambria's new record "Vaxis — Act I: The Unheavenly Creatures." 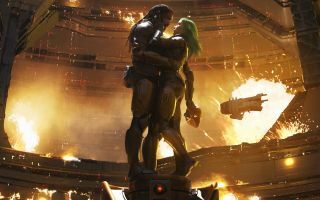 Progressive rock band Coheed and Cambria have re-engaged with their sci-fi roots for a new concept record dubbed "Vaxis – Act I: The Unheavenly Creatures." This latest installment in the band's "Amory Wars" universe is staged on a planetary prison "assembled from the cracked worlds of the great crash," according to the album's first track, "Prologue." The record, in part, tells the story of a pair of romantically involved "unheavenly creatures" that are attempting to escape the clutches of this penal institution. The prison is one of the fictitious galaxy's many privatized detention zones. The songs that have been released to date, including "The Dark Sentencer" and "The Gutter," give first-time listeners a great taste of the sound of the band and give longtime followers what they've come to expect. During "The Afterman: Ascension" tour, Claudio Sanchez — the band's creator, singer and guitarist — gave us a glimpse into his creative process and the "Amory Wars" concept at New York's legendary Webster Hall music venue. The interview became the first episode of Space.com's CosMix video series and can be seen above. Since 2013, the band has kept busy with several tours and, in 2015, released its first non-concept album, "The Color Before the Sun." Space.com featured the song "Here to Mars" from that record in a SpaceX Falcon Heavy launch highlight video. The new record "Vaxis – Act I: The Unheavenly Creatures" is more than 78 minutes long and features 15 new songs. The band has also created several videos in anticipation of the record's release on Oct. 5, 2018. Tour dates and more info about the band can be found on their website, coheedandcambria.com. Follow Steve Spaleta on Twitter. Follow us @Spacedotcom, Facebook and Google+. Original article on Space.com.